From Lombok, we are moving to Bandung, West Java. It is one of favorite destination for culinary hunting. Among the typical Sundanese food, nowadays there also available many of modern asian or western restaurant around city. As this time, i've back to one of great restaurant i had been before last year. Two Hands Full, it is spotted around Sukajadi area, Bandung. From the street, you need to see carefully where the signage is really tiny up right at corner of restaurant. As i remember, they are not in same place i had before. Actually they have been moved for quite some time, now they have bigger parking lot and also bigger space of restaurant. Still with their own concept, industrial dark color around, brick, pipes accessories and it is available outdoor side at the back. It does really perfect spot for taking picture and especially they are using old wood for the table. First dish came out was Mille Crepes, the layer cake with brown color. i did not have a try of this, but friends said this is lovely. Even though bit melted, but it has balanced sweetness. For the main brunch, i have a Pulled Pork Benne. 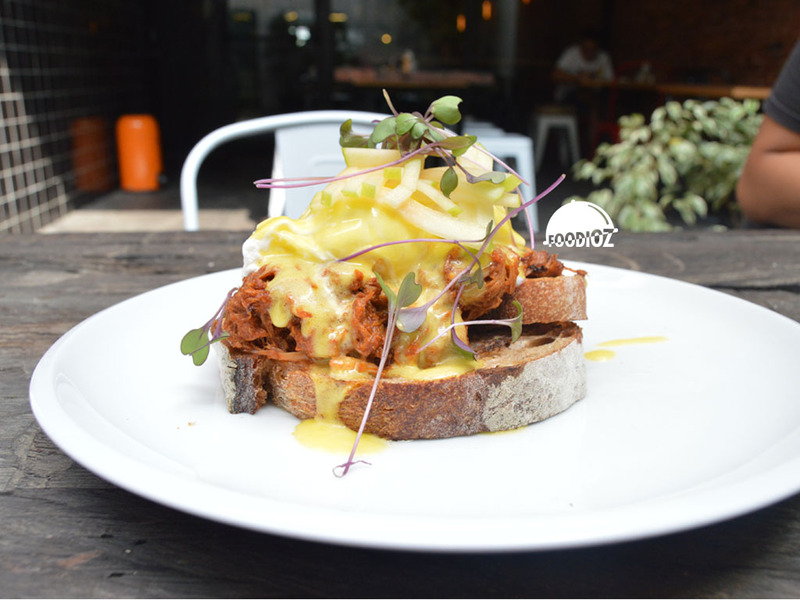 Braised pulled pork topped with poached eggs, poured with hollandaise sauce based on sourdough. It absolutely nice presentation, stunning yellow hollandaise sauce covered up pulled pork on thick sourdough bread. But actually the pork is too plain, nothing special taste from it. Only it has nice texture and melted egg such a pleasure. 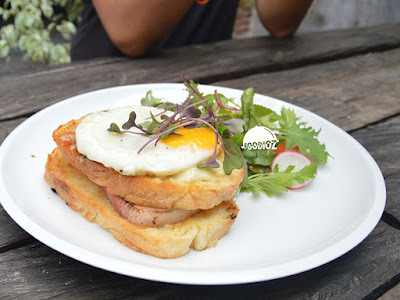 Another cuisine is Croque Madame. It is a smoked gammon ham, gruyere cheese, parmesan and topped with fried egg. Since i do not like fat part of pork, so i did not have taste of this. 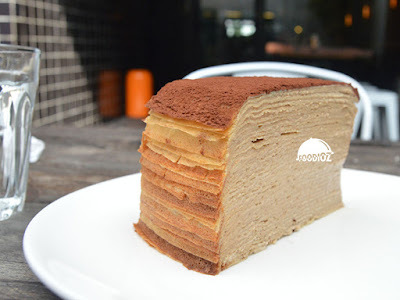 But friends said it is a huge thick slice of pork with seasoning have good taste and sure would fulfill stomach. Still the best here is the Big Brekky. But too bad i did not take any picture of it. It's consisted of grilled bacon, sausages, mushroom and any other ingredients. It is such a perfect choice for brunch, i remember eat that last year and i sure satisfied with it. Also do not forget to try their Chai Latte. Tea with good smell and great spices give a sensation for you tea lover. Or you could try the affogato as my favorite choice in here. Cold coffee with delish vanilla ice cream such a briliant. For price here, i think much fair enough for such delicate foods. 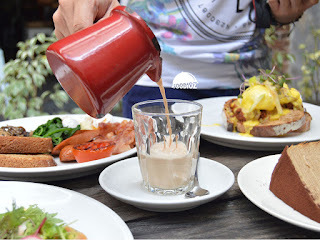 During brunch, i think this place could be good choice when you are visit Bandung.